Shoot of King Nagarjuna's 'Manmadhudu 2' started today. Film is being Produced by Akkineni Nagarjuna, P. Kiran on Manam Enterprises, Anandi Art Creations banners Directed by Rahul Ravindran. Senior writer Satyanand handed over the Script to Director Rahul Ravindran. Amala Akkineni clapped the first shot. YuvaSamrat Naga Chaitanya Switched-on the camera. First shot picturised on God's photos. Sumanth, Sushanth, Nagasuseela, Yarlagadda Surendra, Akkineni Family graced the event with their presence. After a week schedule in Hyderabad film unit will move to Portugal for further shoot. Rakul Preet Singh will be seen as heroine alongside King Nagarjuna in this film. Director Rahul Ravindran says, " Nagarjuna Garu liked 'Chi La Sow' and he released it through Annapurna banner. He said that he will do a film with me. Keeping his word, Nagarjuna Garu is doing this film with me. Thanks to him." 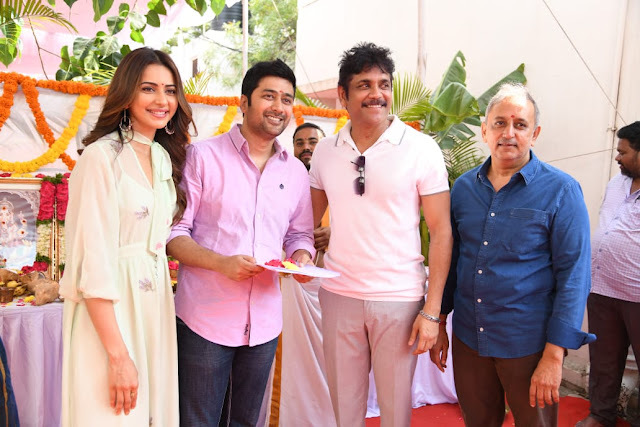 Along with Akkineni Nagarjuna & Rakul Preet Singh other principal cast involves Lakshmi, Vennela Kishore, Rao Ramesh, Nasser, Jhansi, Devadarshini.